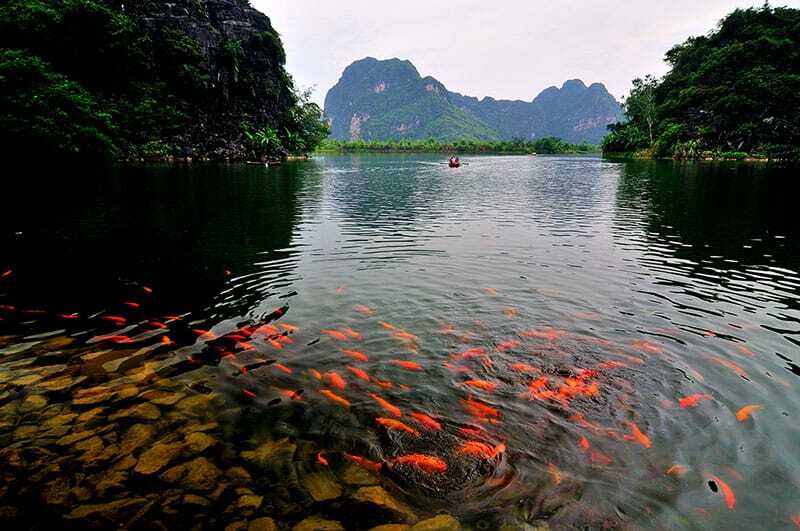 Trang An Scenic Landscape Complex, A UNESCO’s World Heritage Site since 2014, is a must-visit attraction in Ninh Binh. It’s about 100km away from Hanoi capital, Trang An complex, Trang An grottoes is one of the most beautiful and charming karst region in Vietnam. Covering an area of 1,961 hectares, Trang An is a spectacular landscape of limestone karst peaks and includes three main functional zones: Center area for welcoming visitors and hosting festivals; Grottoes area with 48 grottoes and caves, 31 large and small valleys; and Spiritual cultural area of Bai Dinh Pagoda. The whole complex is home to 47 historical relics and nearly 100 grottoes stretching around 20km. 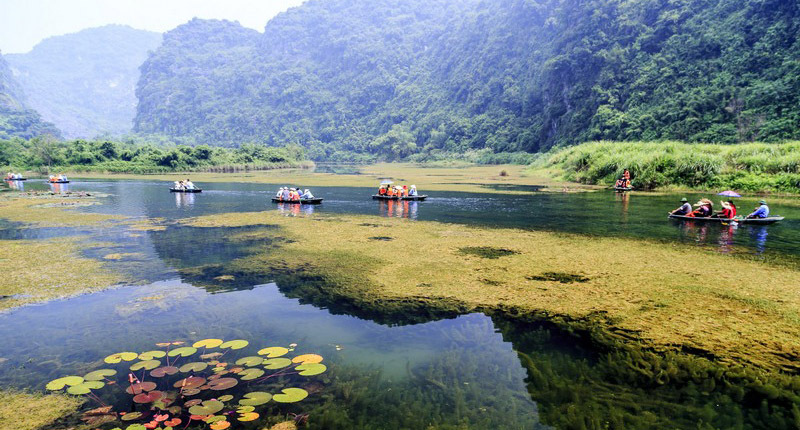 The harmonization of the mountain, the river, the forests and the sky of Trang An would create a vivid natural landscape, make it become a mysterious wonder of Ninh Binh province. Trang An grottoes is the evidence for the final stages of the Karst evolution during the wet tropical climate. The multiform in term of geology and Geo-morphology in Trang An is the result of continuous geological activities for hundreds of millions years. During this time, the Geo-morphology depression as well as the partition of giant Limestone sediment occurred there, accidentally created charming mountainous areas, valleys, and hollows as nowadays. With many caves and grottoes, whose names attached to many stories like Hang Sinh, hang Dia Linh, Hang Ba Giot, Hang Nau Ruou, Hang Quy Hau, etc., (hang means cave/grotto) Trang An is the only place in Vietnam that has most inter-connecting caves in which there is a cave with a length of up to 2 kilometers. Thanks to these amazing connection that will let you discover the caves in a perfect round circle. When your boat pass through these stunning grottoes of Trang An, you even have to lower your head to avoid being touched by the cave’s ceiling above your head. 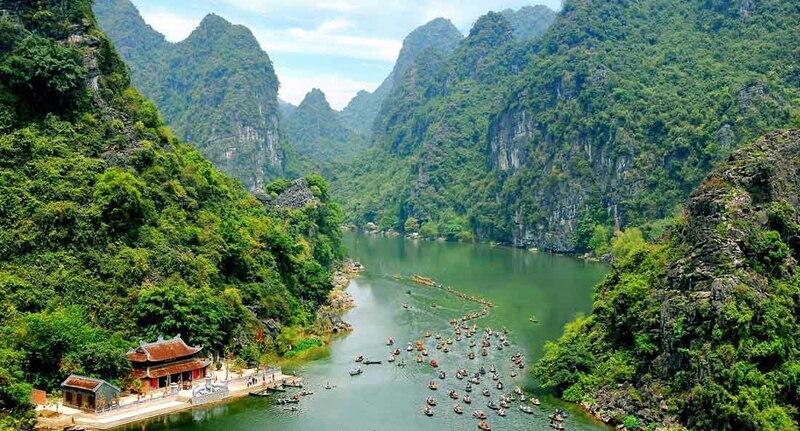 More magically, in Trang An, not only the grottoes but also the lakes are inter-connected and making a perfect self-contained system, rather assembling as a labyrinthine battle array or common sayings as a uninterrupted map. Join with us on Bai Dinh – Trang An day tour or Trang An boat tour or request your own daytrip. Get your trip to Vietnam planed quick and easy, free advices and quotation, local support always.